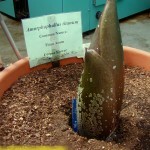 Perry the Titan Arum (aka Corpse Flower) continues to grow rapidly. The shoot that is now arising has a suspicious rotundity – the shape indicates that it could well be an inflorescence (or perhaps the reincarnation of John Adams). If it’s an inflorescence, I estimate that Perry will flower toward the end of July or in early August. Noticeable growth occurs day by day. 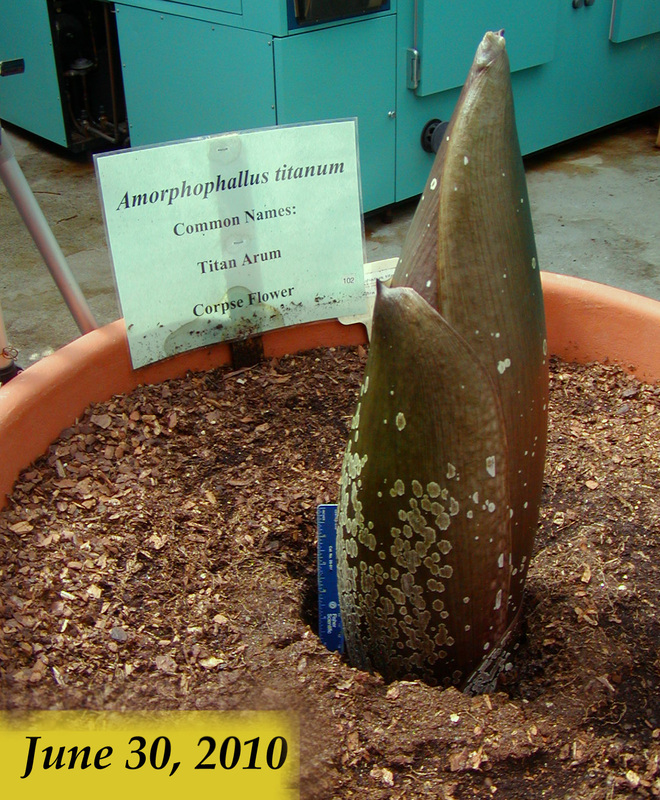 Stay tuned to the Titan Arum Webcam! 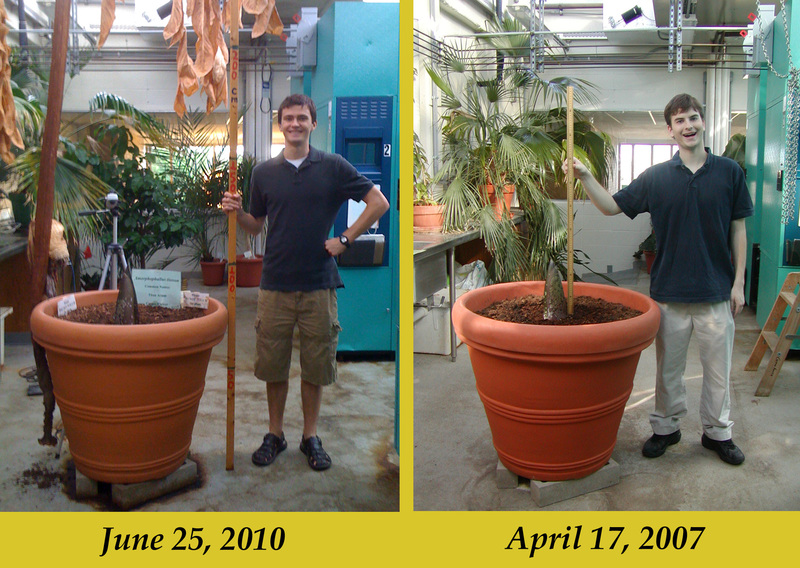 Meanwhile, here are some initial photos – comparison of the new growth [with Anthony Cesnik (Gustavus 2012) as scale object] to a similar stage of development from April 2007 (with Alex Burum, classic Perry scale object, Gustavus 2008). 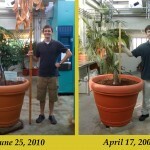 The second photo shows Perry’s progress from May 30 through June 25, with appropriate human scale appendages. Click on the thumbnails to see the photos in their entirety (the thumbnails cut off parts of the photos). For further details on each photo via Flickr, click here, here, and here. 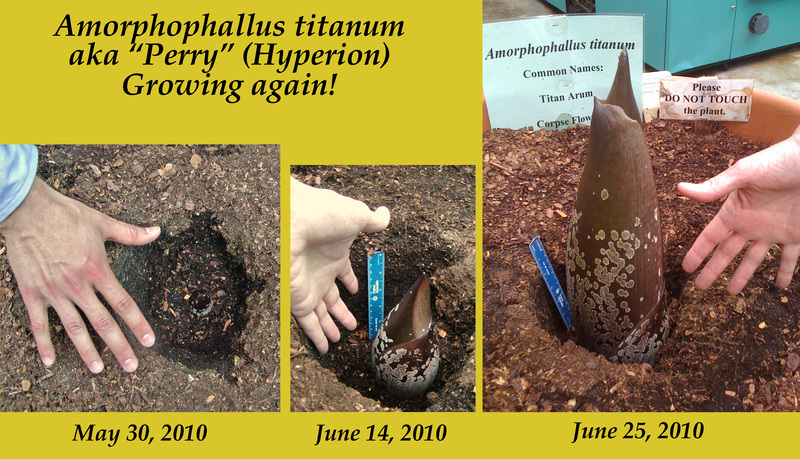 Perry is on Facebook as Perry T. Titan and as the subject of the Titan Arum Photo Club. 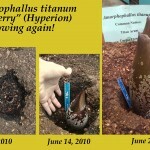 Click here for earlier Titan Arum Blog posts, March 2007 – June 2010.